The term Haapsalu rätik (Haapsalu shawl or scarf) seems to be a universal title for a lace shawl or scarf in Estonia. In Estonia, a true Haapsalu rätik is square, while a triangular shawl is known as a kolmnurk rätik and rectangular shawls or scarves are known as sall. All are made with openwork lace patterns, whether traditional or newly designed, and if there is an äärepits or lacy edge for a traditional style, it is always knitted separately and sewn to the completed center section by hand. There is much more to these shawls than meets the eye. It is the small details that make them so interesting and fun to knit. 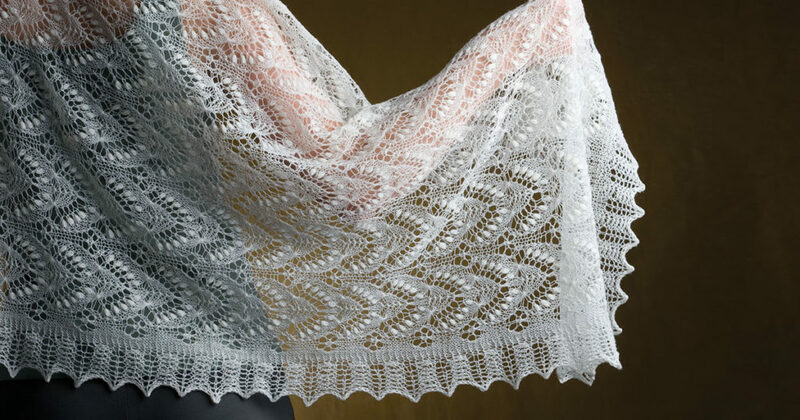 To design a rectangular sall (shawl or stole), begin by choosing a stitch pattern for the center section (for stitch patterns, see Knitted Lace of Estonia [Interweave, 2008], from which this article was adapted). Knit a sample swatch of the pattern, perhaps two repeats wide and two repeats high, then bind off the stitches. Block the swatch to open up the lace design. When dry, measure the width and height. Use these measurements to determine the number of pattern repeats you’ll want for the shawl center, which will determine the number of stitches to cast on. Be sure to add balancing stitches if necessary to make the pattern match or create a mirror image at the two selvedge edges. When deciding on the number of pattern repeats, keep in mind that blocking will add considerable length and width, as will the addition of frame stitches and a lacy edge. The average size for a finished rectangular shawl from Haapsalu measures about 23½” (60 cm) wide and 67″ (170 cm) long. The center section is always surrounded by a narrow garter-stitch frame. If a lace edge will be attached, the frame is usually eight rows (four garter ridges) tall at the top and bottom and four stitches wide along each side. If there will be no lace edge, the garter frame is usually five garter ridges tall at the top and bottom and five stitches wide along the sides. The frame at the bottom and top of the shawl must complement the frame at each side. When planning your own design, be sure to add in these frame stitches to the total stitch count for the width and row count for the length. 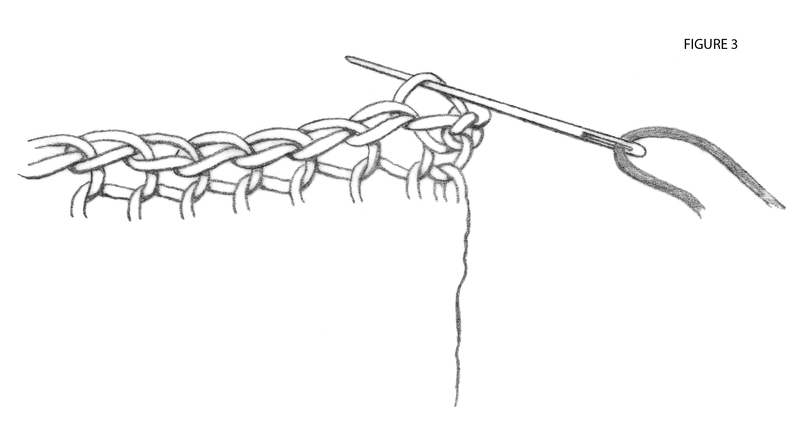 Using the elastic knitted method (see below), cast on the desired number of stitches. Except for the very first row after the cast-on, begin every row with a slipped stitch (the first stitch of the first row is knitted) to form a selvedge edge that is easy to see when sewing on or picking up and knitting the lace edge later. Slip this edge stitch purlwise with the yarn in front, then return the yarn to the back between the two needles in preparation to knit the next stitch. Work your chosen number of garter rows, then beginning with a right-side row, work the center pattern. To help keep track of the garter-stitch frame at each side, place markers after the frame stitches on the right edge (as seen when the right side is facing) and before the frame stitches on the left edge. Repeat your chosen center pattern for the desired number of pattern repeats. Work eight or ten rows (four or five garter ridges) of garter stitch to mirror the garter frame rows worked at the beginning of the piece and end having worked a right-side row. With the wrong side facing, use the k2tog bind-off to bind off all of the stitches. This method will ensure an elastic edge that will stretch with the center section. If you don’t plan on adding a lacy edge, weave in any loose ends into the wrong side of the garter-stitch frame, (where they will be less visible). Trim the ends, leaving 2″ (5 cm) tails to be trimmed after the shawl is blocked. 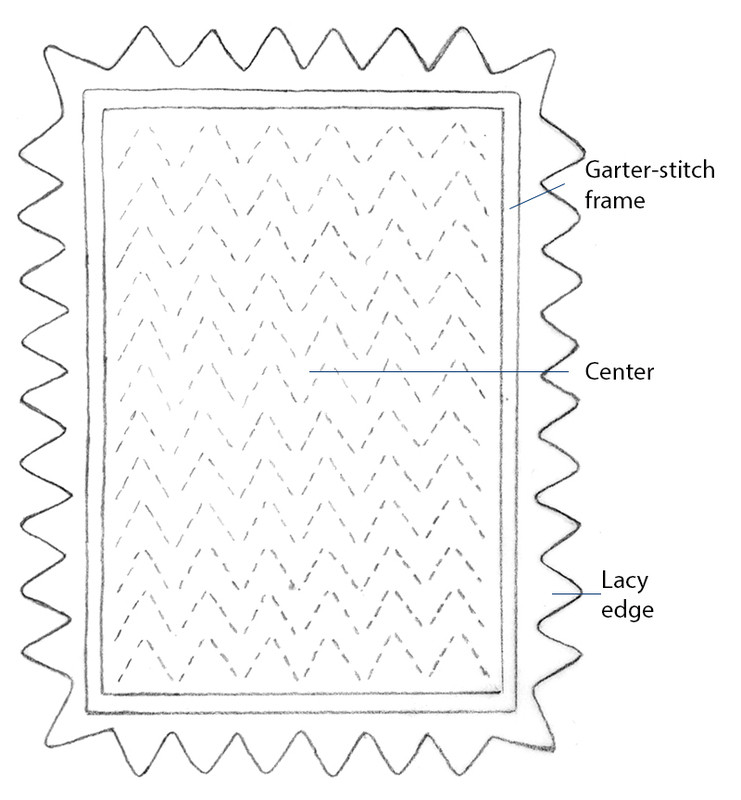 If you plan to sew on a lace edge, leave one tail at each corner (the lower left corner and the upper right corner as viewed from the right side) where the two halves of the lace edge will meet. These tails will be used to sew the corners of the lace edges together. For a traditional Haapsalu shawl, the lace edge is knitted in two separate pieces that are sewn to the center section by hand. The most common edgings are 2″ to 4″ (5 to 10 cm) wide and most repeat over 10 stitches. Typically, ornate centers are combined with simple edges. The two parts of the lace edge are joined together at opposite corners of the center piece. If you prefer to work the lace edge in a single piece (which is not as common), there will be a single join at just one corner. To begin, you’ll need to know the number of stitches across the width of the center piece, including the frame stitches. You’ll also need to count the number of edge stitches along the length of the center piece, again including the frame rows. Because the first stitch of every row was slipped, there will be half as many edge stitches as there are rows of knitting. For example, if the center section is 300 rows long, there will be 150 edge stitches. This method calculates the number of stitches needed for each half of the edge. Rounding to the nearest number divisible by 10 + 1 gives us 361 stitches for each half. Cast on for the lace edge using the knitted cast-on as for the main piece, but work it with two strands of yarn held together to add weight and strength to this cast-on edge. The Haapsalu knitters may choose to use a needle one to two sizes larger than was used for the center for this cast on and a needle one size smaller than the cast-on needle for knitting the lace. However, I usually knit my shawls using the same size needle for the center and lace edgings. Break off one strand and continue with a single strand. Knit two rows. Begin the lace edge pattern at the point in the pattern where the lace edge scallops outward. For most edging patterns, this will occur along a line of double decreases. However, you’ll want to begin the edge with a single decrease—“sl 1, k1, psso” at the beginning of the row, and “k2tog” at the end of the row. The edge stitches on these lacy edges are not slipped. All subsequent decreases at this point in the repeat usually will be double decreases or two single decreases separated by a knit stitch. Most true Haapsalu lace edges are worked in garter stitch (right-side rows are pattern rows and wrong-side rows are simply knitted). Work the lace edging for the desired width, then bind off with a single strand of yarn with the wrong side facing, using the k2tog method. The lace edge is always joined so that the widest part of a scallop is centered over two opposite corners and so that the two sections are joined at the other two opposite corners. (If the lace edge is made in one piece, there is a join at just one corner.) The two pieces are sewn onto the center with a single strand of yarn that is attached to the ball. The sewing is always done with the yarn attached to the ball instead of cutting a separate length (that may not be long enough to work the entire seam). The sewing yarn is not cut until both pieces of the lace edge have been attached and eased around all four corners to ensure that it will stretch as much as the knitted stitches. 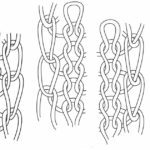 I learned the following method of sewing the lace to the center of a rectangular sall from Aime Edasi in Haapsalu. 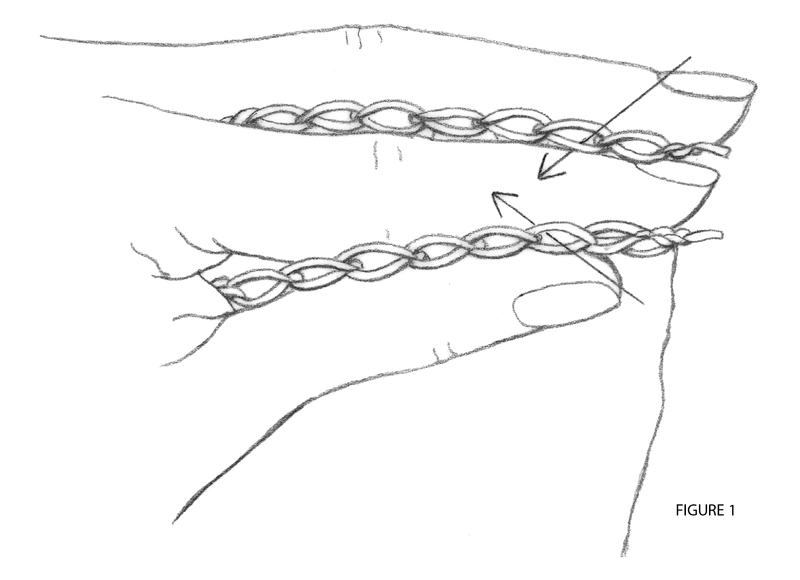 Hold the edge of the center section between your thumb and index finger and the bind-off row of the lace edge between your index and middle fingers so that the right sides of the two pieces are facing together (Figure 1, right; the arrows show the direction the threaded needle will go through each piece). The center piece is closest to you. The arrows indicate the path of the needle while seaming. Begin at the lower left corner of the center piece (the left edge of the cast-on row). With the yarn from the ball threaded on a tapestry needle, bring the threaded needle from back to front through each of the first three loops of the lace edge (Figure 2), then through the first loop of the center piece from front to back (Figure 3). 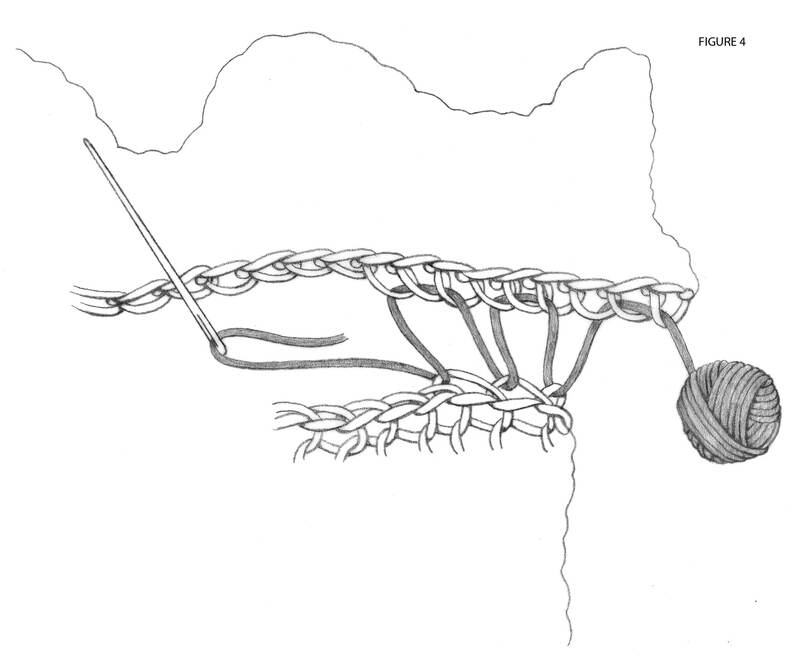 Repeat this three-one (3:1) ratio two more times (three times total)—nine stitches of the lace edge and three stitches of the center section have been joined (Figure 4). Next, take two loops from the lace edge and one loop from the center piece. Repeat this two-one ratio (2:1) two more times (three times total). Then work up the side of the shawl, alternating taking one loop from each piece two times, then two loops from the lace edge and one loop from the center piece (i.e., alternate 1:1, 1:1, 2:1) until you are 15 stitches from the center of the scallop on the lace edge that will form the corner and six stitches from the corner of the center section. Next, take two loops from the lace edge and one loop from the center piece three times, then take three loops from the lace edge and one loop from the center piece three times. Continue this process for the top edge of the center piece: take three loops from the lace edge and one loop from the center piece three times, then take two loops from the lace edge and one loop from the center piece three times, then take one loop from each piece two times, alternating one loop from the lace edge and one loop from the center once (i.e., 1:1, 1:1, 1:2) until you are 15 stitches from the center of the scallop on the lace edge that will form the corner and six stitches from the corner of the center section. Take two loops from the lace edge and one loop from the center piece (2:1) three times, then take three loops from the lace edge and one loop from the center piece (3:1) three times to end up at the corner. Join the other lace edge to the remaining two sides of the center in the same manner. When the entire lace edge is attached, sew the ends together using the yarn tails at the corners that were not woven in earlier. Do not sew the ends with the yarn used to attach the lace edge. Carefully pull on the sewing yarn so there are no puckers, gathers, or tight spots in the seam between the center and lace edge, being careful not to pull the cut end of the sewing yarn through the sewn stitches. When you are satisfied that the lace edge is eased evenly all around, cut the sewing yarn from the ball. Wait to weave in the ends until after the shawl has been blocked. Wash the shawl in warm water (the Estonians use rain water) and a mild soap. Squeeze gently, rinse and squeeze again, never wring. While the shawl is still wet, “dress” (block) it on a frame made of wooden boards with nails at even intervals that are lashed together at the corners or pin it out onto a carpet covered with a sheet or towel. An alternative that isn’t used in Estonia but is popular among American knitters is to use blocking wires. Either way, allow the shawl to thoroughly air-dry before moving it, then weave in the loose ends. When she’s not traveling to teach workshops, NANCY BUSH spends time in her studio in Salt Lake City, Utah, planning her next Estonian-inspired knitting project. Visit her website at www.woolywest.com. This story was originally published in the 2013 Spring edition Interweave Knits. Find origin stories, tech tips and more in every issue of Knits!